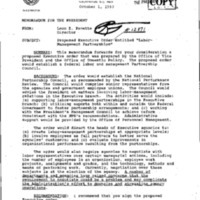 This collection consists of records related to Executive Order 12871 on Labor-Management Partnerships. This Executive Order, which President Clinton signed on October 1, 1993, created the National Partnership Council. The Council was comprised of members of the major labor union and advised the President on labor-management relations within executive branch agencies. 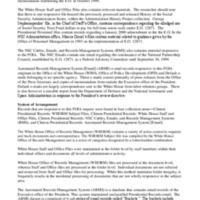 This collection consists of correspondence, White House memoranda, and email regarding matters related to Executive Order 12871.